With a stay at Howard Johnson by Wyndham Grand Prairie Near Lone Star Park in Grand Prairie, you'll be within a 15-minute drive of Six Flags Over Texas and Six Flags Hurricane Harbor. Featured amenities include a business center, complimentary newspapers in the lobby, and a 24-hour front desk. Free self parking is available onsite. With a stay at Town House Suites in Dallas (Oak Cliff), you'll be within a 15-minute drive of Dallas Zoo and Methodist Charlton Medical Center. Free self parking is available onsite. 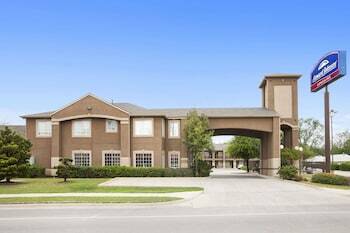 With a stay at WoodSpring Suites Signature Las Colinas in Irving, you'll be within a 10-minute drive of Irving Convention Center and University of Dallas. Free self parking is available onsite.